“[low baritone] Swing low … [kid’s voice] Happy feet” – okay it doesn’t quite work. It’s all downhill from the highpoint to the lowpoint – so to speak. While visiting a state for its highpoint, you might consider visiting other geographic extremities like its lowpoint. And I mean more than visiting Lowpoint, Illinois after summiting Charles Mound. The USGS publishes the “Elevations and Distances in the United States” which is nicely summarized in Wikipedia’s “List of U.S. states by elevation“. After reaching the highest point in each of the 50 US states, a natural follow-up was to visit all of the state law points. Jack Parsell accomplished this mostly during the years 1988 through 1991. Visits to beaches in some of the coastal states occurred at earlier times, as much as forty years ago. This guide provides directions and hints for getting to the interior low points. Of the 51 low points (including DC), 24 are currently considered coastal – being at sea level for states bordering the Atlantic, Pacific and Gulf of Mexico, or lake levels for some of the interior states. Access to any of these low points is simply a matter of going to the beach or shore of your choice and dipping your foot in the water. Alaska, California and Louisiana have locations below sea level, so their coastal beaches do not count as low points. Note that the -4ft level for Alaska has not been verified by USGS, so any sea level visit is still acceptable. As mentioned above, possible new low points for Texas and Washington may remove their coastal low point status. The interior state low points are usually located on river banks or lakes where the state line reaches or crosses the water. Two of the states, New Mexico and South Dakota have low points which used to be on river, but now are on lakes because of dams downstream in the next state. Because of their unique nature these two are included with the interior states and directions for access are given. Precise locations are often difficult to determine. In many instances state line fences stop at the edge of the river flood plain, and a compass and/or GPS must be followed for the remaining distance to the water. As contrasted with mountain summits which are usually on public land, many of the interior low points are on privately owned property. In some instances it is difficult to determine the ownership and to obtain permission to go on the property. Information in this regard is given in the directions for several of the low points. Finally, another factor of concern is river water level. Many of the low points are situated on flood plains which during periods of high water are inundated and inaccessible. It is best to go to many of these locations during low water periods. In Appendix – Interview with Jack Parsell we have an excerpt of an interview with Jack Parsell about low-pointing. What got you started? Are there any rules? What is your favorite lowpoint? etc. The USGS publishes the “Elevations and Distances in the United States“. Wikipedia’s “List of U.S. states by elevation“. netstate.com has summarized the “World Almanac of the U.S.A.” data into table form. The Trek Stop – Bill Wentzel’s blog has a few low-point trip reports. stenseth.org – Dale Stenseth’s website showing his 7 lowpoints. Death Valley Adventures – Steve Hall documents the actual lowest point in California. US Ends.com – Dale Sanderson documents the history and analysis for designating Colorado’s lowest elevation. CN Traveler – Ken Jennings article on California’s lowest and highest points being in Inyo County. Deseret News – Lynn Arave’s article on Utah’s lowest point. AlansFactoryOutlet.com – Offers a nice infographic showing each state’s highpoint and lowpoint. Lowpoint Discussions – The Highpointers Club has transferred over the old/archived “America’s Basement” forums to this website. Finally, you can see who has completed the 50 state lowpoints at our “Lowpoint Score Board” page. Q1: How many states have their lowpoint below sea level? Q2: Which state has the highest lowpoint? Q3: Which state has the shortest distance between its highpoint and lowpoint? Q4: Which state has the longest distance between its highpoint and lowpoint? You may also be interested in a “US States Lowest Points online quiz hosted on sporcle.com. This page, “US Lowpoint Guide”, is an aggregation of multiple sources. It is largely based on Jack’s guide book. It includes several updates/clarifications based on trip reports from various contributors. Please contact us at guides@highpointers.org if you have any suggestions or updates. You will see many lowpoints are defined by water (river, ocean, lake). Where do you define the lowest point for North Carolina when its the Atlantic Ocean? This guide arbitrary chooses the closest point (as the crow flies) to the respective highpoint. In some cases it also lists an alternate closer equivalent point (eg, Puget Sound and Pacific Ocean for Washington state). This page contains three major sections below. The first contains a map showing each state’s highpoint, lowpoint(s) and lines drawn between them. Below the map is a large table listing all the lowpoints and their associated data. The middle section is the collection of show/hide (open/close) information panels with details for each lowpoint. This includes trip reports and updates as well as data like elevation, location, etc. The last section is a series of appendices such as trivia answers, an interview with Jack Parsell on low-pointing, etc. This table provides summary information about all the lowpoints. This section contains information panels for each lowpoint. Click on the name of the lowpoint and a panel opens up presenting the details about the lowpoint. This includes Jack’s trip report and more recent trip reports or updates if available. You will also find additional information such as elevation, location, etc. ACCESS: This interesting area is located 30 miles W of Mountain Village, AK, an incorporated village with a landing strip and a seaplane anchorage on the N bank of the Yukon River. I thought I had been to all the state low-points until Alaskan Steve Gruhn e-mailed me in July, 2000 about a large lake in the Yukon River delta that is below sea level. With a surface area of about 29 sq. miles Nunavakanuk sits in a below sea level depression covering about 60 sq. miles. There are many other smaller lakes within the depression, and it appears that lakes and swampy areas cover about 90% of the 60 sq. mile area. Also, within 5 or 6 miles N of the big depression, there are at least eight other very small, below sea level potholes. These are shown clearly on the Kwiguk A-6 topo map, with sea level lines surrounding each of them. It appears that the big lake is the lowest point at -4 feet. USGS has acknowledged existence of this site but will not formally designate it as official until further surveys are conducted. It appears that in summer the only feasible access to the lake would be by seaplane. However the terrain is not all soggy. At the SE end of the lake is a significant highlands, the Kusilvak Mountains, with a top elevation of about 2430 feet, rising out of Nunavakanuk Lake in a distance of only a little over 2 miles. Coordinates for the lake are N 62.059°, W 164.668°. Mountain Village is at N 62.086°, W 163.729°. Until USGS formally approves this as the Alaska low point, a visit to any sea-level coastal beach is acceptable. Here Connard Hogan touches Alaska's lowpoint near Ketchikan. The Yahoo Group 'prominence' has two messages related to Nunavakanuk Lake (msg# 155) and its possible formation (msg# 156) making it a below sea level lake. [Ed: partially published in #105-14q2-p15]. The two Kwiyuk topo maps available are both dated 1952. The 15'x30' map shows Lake Nunuvakenuk and several other lakes as below sea level, as indicated by a zero-elevation contour surrounding the area, and negative elevations indicated on at least three of them. This map indicates "minor revisions 1972". 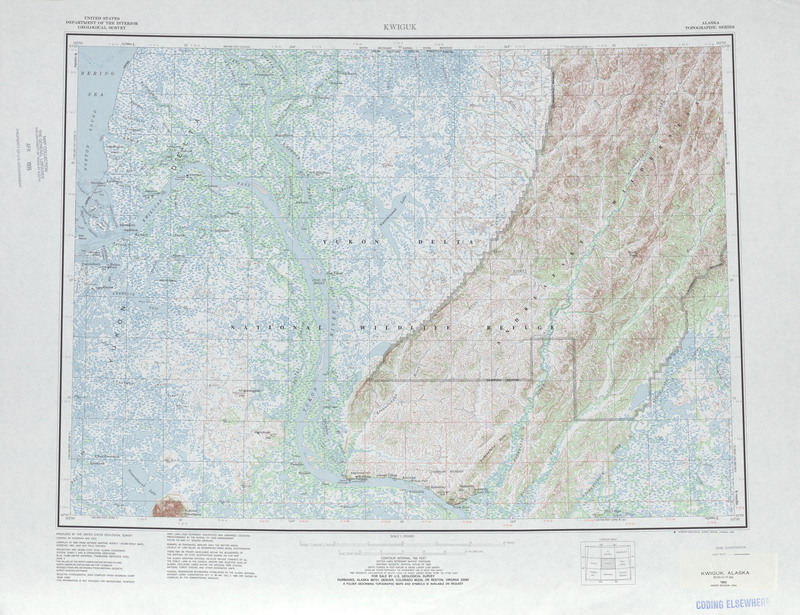 The 1x3 degree map "with minor revisions 1994" has no zero-elevation contour and no elevation shown in the lakes that had shown negative elevations, but other lakes show their positive elevations on both maps. This indicates that between 1972 and 1994 they decided to eliminate the negative elevations, although they did not update the 15'x30' map. As Jack noted, the USGS has not taken an official position on this issue. ACCESS: Take route 82 W from Crossett, AR. Cross the Ouachita River and continue W through Felsenthal National Wildlife Refuge. Beyond the refuge take a gravel road S. At the first stop sign turn L and proceed to Huttig. Continue toward Felsenthal Lock and Dam but bear off to the R rather than going L up to the dam. Continue along the river for about 4 miles to a clearing near a river gauging station. The road goes on from the clearing as a 4WD path near the river to the LA line. We walked from the clearing the remaining 1.7 miles to the LA line along the river bank. The pronunciation of Ouachita sounds almost like Wichita. The final dirt road along the river ends at a large turn-around with a house nearby. We walked from there through marshy ground the rest of the way to the border and lowpoint. There was evidence of some all-terrain vehicle use in some areas, but no actual 4WD road. The ground was too soft for any heavier vehicles like 4WD trucks. The trip report is at Primate's Big Adventures. ACCESS: The low point is at the Mexican border. You should check with the Customs Office and Border Patrol so that they won't think you are wetbacks trying to sneak across the border. From San Luis, AZ follow farm roads W to an irrigation channel that runs very close to, and parallel with, the river. Walk across the irrigation channel bridge which a little N of the border. Follow the river bank S to where the border line fence reaches the river. When we were there in Nov, 1990 there was no water in the river. All of the remaining Colorado water was flowing in the irrigation channel into Mexico. We could walk out to the center of the sandy river bottom to what we estimated was the boundary line. A 20' border wall already exists in this area. We drove along dirt roads through farm fields in this area and came to the corner of the fence. A border patrol agent arrived about two minutes later, but he was just checking what was going on and found it interesting we were visiting low points. That location is as close as you can get (from the US side) to the true lowpoint in the riverbed. [Ed: In #107-14q4-p40, Connard Hogan mentions "I felt disappointment at the AZ lowpoint, when our closest approach left us blocked by the twenty-foot border fence some 200 yards from the Colorado Riverbed low point. A border guard drove out of his way to investigate us close up, too.]. Geology.com indicates Death Valley is #8 lowest depression below sea level in the world. Inyo County contains both the lowest point in North America (Badwater Basin at -282 feet) and the highest point in the lower-48 United States (Mt Whitney at 14,494 feet). There is even a backcountry trail (L2H) between the two points. ACCESS: According to the U.S. Geological Survey, Badwater at -279.8' is not the low point. There are two locations out on the salt flats which have been measured at -282'. One is about 4 miles NW of Badwater. The other is only 1/2 mile SW of the junction where the Natural Bridge road branches off from route 178. This junction is 3.5 miles N of Badwater. We opted for this nearer one. Just walk out on the salt flats for about 1/2 mile and you will find a series of salt water pools in a depressed area about 1/4 mile long by 1/8 mile wide. There are no markers so you have to estimate which is the lowest pool. The trip report at "Death Valley Adventures" gives coordinates and pictures the "-282 Rock" at the actual lowest point of Badwater Basin. Dale Sanderson has an excellent article describing the history of Colorado's lowest point. He was instrumental in getting the Arikaree River where it leaves CO designated as the lowest point by the USGS. ACCESS: Until May 2000 USGS accepted the Arkansas River where it exits CO into KS as the lowest point in CO. However, Fred Anderson, Adam Roddy, and others in CO, found two lower spots, the lowest being where the Arikaree River passes from CO into KS. Based on contour lines on the 7.5' USGS topo map, the elevation is a little lower than 3320'. I wrote to the USGS and received a reply in which they agreed on May 24, 2000 that the Arikaree River at the CO-KS line is the low point. This low point at approximately 3315ft is the highest state low point. From the center of Haigler, NE, drive W on US-34 0.7mi and just after the bridge over Sullivan Draw go straight W. Again straight at an intersection 2.6mi farther W. Follow the road W and S going thru the NW corner of KS and on to the CO line. Park near the sign "Entering Yuma County". This is about 6.8mi from US-34. On foot, go roughly S in a depression between two fields toward the river. Cross a barbed wire fence running E-W. Continue to the river, then go W (right) a short distance to where an old fence comes toward the river at an angle. Where the fence intersects the river should be the low point. We noted the barbed wire fence near the road is electrified, so we found a point to get under the fence and were very careful to not touch the wires. Eastern Colorado was in an extreme drought at the time, so we found the creek was dry. About 100 feet from the border was a low mud hole used for water by cattle, so we determined that was the lowpoint when we were there - several feet lower than the normal river level. ACCESS: In Idaho go W on US-95 and get off at the interchange for Route 128. then go W on Route 128 to the WA border. Walk S across the RR track and down to the water. This is where the Clearwater River empties into the Snake and is the point farthest downstream in Idaho. There is a benchmark in a concrete block near the RR tracks indicating the exact location of the border. Proceed south to the river from there. ACCESS: From cairo, IL drive S to Fort Defiance State Park. At the far S tip of the park, where the Ohio River joins the Mississippi is the lowest point in Illinois. Out in the middle of the rivers at their confluence is the tri-state junction #61-IL-KY-MO. ACCESS: From a little W of Mt. Vernon, IN go S on Route 69 for 8 miles to Hovey Lake State Game Preserve. Then go W 1.2 miles on the paved road and keep on W 1.1 miles on a gravel road (paved road goes S to Uniontown Lock and Dam). Then turn left (S) for 0.4 mile, then right (W) opposite a Mobil tank farm. Go on W about 2.5 miles depending on the condition of the road which becomes a farm lane and eventually a trail. Hike the last 0.1 mile trail to the confluence of the Wabash and Ohio Rivers. At low water, the almost vertical bank makes it difficult to get to the edge of the water. Out in the middle of the rivers at this point is the tri-state corner #69 IL-IN-KY.
ACCESS: The low point is where the Des Moines River enters the Mississippi, just south of Keokuk. Coming from the W on US-61 go across the Des Moines River bridge into Iowa. A short distance beyond the bridge there is a posted road to the right (S) that goes about 1 mile down to the river bank at the confluence of the rivers. We did not get permission to go in, but it would be advisable to do so. At this location there is also a tri-state corner of #60 IL-IA-MO in the middle of the confluence of the two rivers. ACCESS: When Clark Hall and I were there in 1988 a bridge over the Verdigris River a little N of the OK line was being rebuilt and was closed. So, we went in from the W side of the river via farm lanes and across fields, a very confusing route. A better way is on the E side of the river. From Coffeeville go S on US-169 to the edge of the city and turn E on County 1400 RD just before reaching a bridge on route 169, which is about 1.5 miles N of the OK line. Continue E on this side road to the Verdigris River bridge. Then go about 0.1mi to the second house on the right with mail box marked Stephen White. Be sure to ask permission to go on the property. From the house walk S about 1/2 mile through a pasture and trees and crossing a small stream which may be dry. When you reach the KS-OK state line fence, follow it W to the edge of the river. Coordinates for the low point are: 36° 59' 57" N, 95° 35' 20" W.
We could not find the mailbox noted by Jack, and we were unable to determine who owns the land on the east side of the river. We went back to the west side of the bridge and noted the lowpoint is located directly across a field, about 1/2 mile south of the road. The gate to the field was open so we just walked across the field to the border (GPS required to locate the point). The field was unplanted but quite wet so we had to pick our way between muddy areas. The last 20 feet between the field and the river had a large amount of poison oak and other thick brush. ACCESS: The low point in Kentucky is on the far W side of the state in a section isolated from the rest of the state by a loop in the Mississippi River. Access is from the S in Tennessee. From Tiptonville, TN go N on route 22. At the 9 mile marker continue straight N on an unpaved road (route 22 turns E). This gravel and dirt road becomes a farm lane along the edge of woods on the left. At 2 miles from the corner of route 22 turn L along the edge of woods and go about another mile along the woods, through the woods, and along the river bank to a relatively clear area opposite a power plant on the Missouri side of the river. Walk down to the river and follow the bank S, downstream along the edge of the water to the KY-TN line where concrete rip-rap and stones cover the bank. This was easy for us because the river was very low at the time. It would probably be impossible with high water. [Ed: also published in #105-14q2-p14]. In KY and TN the lowpoints are on the Mississippi River. When we got there severe flooding was in progress. We didn't think we'd make it to the KY lowpoint since it involves several miles of dirt roads. We ran into a ranger who told us the road was closed ahead due to flooding. We proceeded north along the access road from TN to see how close we could get and came to the area where the dirt road was flooded for about 100 yards. I checked the GPS and found that we were only 60 yards from the border! We decided we could handle this. We put on shorts and sandals and waded along the road through knee-deep water to get to dry land in KY. Although this point is about a mile east of the normal river, the river was flooded and still rising, so on that day this was the lowest point of land in KY.
ACCESS: It is not unusual to find a below sea level location in desert country such as Death Valley in California, but in Louisiana which has plentiful rainfall, how can there be land below sea level that is not covered with water? The answer is in the dike system along the Mississippi River. Without the annual flooding and deposition of silt, the delta land is gradually sinking. The only way to keep the river out is with dikes and pumps. Pontchartrain Park is a golf course containing a group of connected ponds which are the low point. Access is from exit 238 fromI-10 in New Orleans. This is just W of the Inner Harbor Navigation Canal. Once off the interstate find Gentilly Blvd. and drive N from Gentilly on Press Drive to the park. The latest USGS topo map shows a lower contour at the underpass near the NW corner of Pontchartrain Park, so we visited that point as well as the lakeshore of the golf course in the park. Although this is a man-made alteration to the natural terrain, note that any point in the city of New Oreleans is only below sea level because of man-made levees. There appears to be many areas which are below sea level in Louisiana. For example, about 2 miles east of Pontchartrain Park are several areas ([30.02922, -90.00559] or [30.03111, -89.99898] or [30.02892, -90.00976]) which are -12 feet below sea level. NOTE: The underpass Bob mentions measures -15 feet below sea level. Measurements are from the National Map "spot elevation" tool. David Olson emailed me and mentioned a few other areas for contention. For example, east of Eden Isle are several areas (30.224163, -89.760319) which measure -1 to -3 feet below sea level. Or to the east and northeast of Des Allemands are several areas with -5 feet contour lines. ACCESS: From Kennett, MO drive SW on US-412. Just before reaching a bridge over the St. Francis River into Arkansas, turn S on route AC which after 1.5 miles becomes route F. Continue on route F to the MO-AR border. Turn W and follow the border. After a short distance this road turns S and crosses into Arkansas. Don't turn S. Continue W along the border on a dirt road and lane over two drainage canals and finally to a parking area beside the St. Francis River at the Missouri low point. ACCESS: Drive NW from Troy, MT on route 2 for about 12 miles. Look for a poor dirt road on the left (west) which leads steeply down to the abandoned town site of Leonia. Approximate coordinates for the intersection of Rt-2 and Leonia Road are: 48° 36' 40" N, 116° 01' 30" W. The ID-MT line angles across the Kootenai River and touches the right bank about 1500ft downstream (north) from where the old bridge went over the river. The bridge is now gone (2003). Park near where the bridge was and hike downstream (north) about 1500ft along the rather steep river bank to the low point. Coordinates at the low point are: 48° 37' 15" N, 116° 02' 54" W.
When I was there in 1988 we thought the low point was upstream from the bridge and access was easier on the west side of the river. At that time you could walk across the bridge for access to the west side. Newer map research shows that the lowest point in MT is downstream as described above. [Ed: partially published in #105-14q2-p14]. I think this was the most difficult lowpoint. Even though this is shown as National Forest land, there is now a gate on the dirt road indicating the area is closed for the last 1/2 mile. We elected to proceed on foot from there. We found the best access is to take the right fork when the road splits and stay high (about 200 feet above the river). The main road continues down to the old bridge, and would then require traversing along the very steep bank for hundreds of yards with no trail to proceed to the lowpoint. The high fork goes relatively level to a vehicle storage/maintenance area and ends there. We continued a hundred yards or so through brush with no trail to the border and then dropped steeply 200 feet down to the river. It was quite difficult climbing down/up through steep, thick brush, and there was a lot of poison oak that couldn't be avoided. Given the resulting rash, even after a good shower, I will not be going back to this point. ACCESS: From Falls City, Nebraska go E 9 miles on route 159 to Rulo. Turn S on a blacktop road and after 1.5 miles turn left (E) at a T-junction. This is route 7 which follows the river. After 5 miles the KS line is reached. There is an elevated dike-like road heading E along the NE-KS line blocked by a gate. To the left of the gate a large sign commemorates the establishment of the base line of the 6th Principal Meridian on the 40th parallel. A cast iron marker is located up on the hillside to the west. To reach the low point walk E along the dike-like lane until it turns N. Continue E for the remaining distance (approx. 50 yeards) to the edge of the river. ACCESS: From I-40 in Needles, CA cross the river into AZ and go N 9.3mi from the Needles Bridge on AZ route 95 to Aztec Road. Go W 2.8mi on Aztec across Veteran's Bridge to the first crossroad W of the river. Turn S (left) on gravel road that runs parallel to the river. Travel S a few hundred yards to the state line markers. A little farther S is an easy access to the river giving access to the lowpoint. An alternate route is N from Needles via Pew Road in CA for about 12mi, then turn E (right) on Aha Macav Parkway for 1.5mi. Continue E on Aztec Road to the crossroad mentioned above. The AVI Casino is on the N side of Aztec Road. ACCESS: From either N or S on US-285 drive to the NM-TX line. Turn E on a dirt road just on the NM side of the border. Follow this road 3 miles almost to Red Bluff Reservoir. When the road turns to the N to go down to the water, stop and walk on E to the state line marker on the bank of the reservoir. Note that this low point is on the shore of a lake created in the Pecos River by the construction of a dam downstream in Texas. Before the dam was built the low point elevation on the Pecos River at the NM-TX line was 2840 feet. ACCESS: This low point is on the W shore of the river at the Canadian border. Drive to Pembina, ND. Stop at the US Customs office to let them know what you plan to do. Also, advise the Border Patrol about your proposed itinerary. From route 59 in Pembina turn N on a road just before 59 crosses the Red River in MN. Follow this road which parallels the river for about 2 miles until you reach a barricade across the road at the international border. There is an international boundary marker just beyond the end of the road. Walk due E along a cleared boundary line strip between farm fields in North Dakota and Manitoba. This leads into a woods and across two ravines before reaching the river. We found no marker at or near the river, so you have to estimate it based on compass and/or GPS course followed. Coordinates at the low point are: 49° 00' 00" N, 97° 13' 48" W.
Be sure to contact both Customs and Border Control before following the directions to the dead-end road, which parallels highway 29, to the border. We notified Customs, but they don't pass information on to Border Patrol so we were called back shortly after leaving our car at the end of the road. It was no problem after explaining where we were going, but we should have notified Border Patrol first. There is a steep drop of about 10' to the river at the lowpoint, so it's a good idea to take a short rope to help get back up the bank. [Ed: In #107-14q4-p40, Connard Hogan mentions "North Dakota's Red River crosses into Canada. Steep, muddy bank made the final few feet an exciting challenge, but only after a border guard hurried over to query us about our intentions. "You should've told me beforehand." he said. But he was non-confrontational about it. Just doing his job, I reckoned.]. ACCESS: In the extreme SW corner of OH leave US-50 at North Bend, OH which is just S of Cleves. Take Brower Road W along the Ohio River and continue to the main gate at the power plant on the Ohio River. When I was there in 1988 the then Cincinnati Gas & Electric Co. allowed access to the low point which is just downstream from the power plant where the Great Miami River enters the Ohio River. Note that the present owner of the power plant may not allow you on the property to walk to the low point. The only reasonable alternative is by water, but I have no information on where a boat or canoe could be launched. Also, at this location, out in the waters of the rivers is the tri-state corner #70 IN-KY-OH. [Ed: partially published in #107-14q4-p40]. We went to the power plant office to request permission to visit the lowpoint, but they contacted their headquarters and they refused permission. Therefore, we went to the nearest legal access point a short distance north on the Great Miami River. Note that the true lowpoint is at the south end of the island at the junction of the Great Miami and Ohio Rivers at the OH-IN border, but this point is only accessible by boat. ACCESS: From Cerrogordo, OK drive N on a lane on the OK sie of the OK-AR line. Where the lane turns left (W) park and continue N on a compass bearing to the water. This is about 200 yards distance and includes crossing a small tributary to reach a gravel bar at the bank of the river. In an email from David Olson, he points out that the Rinearson Slough opposite Longview, WA, shows a below sea level contour - 46.101761, -122.990442. You can see this in the 1990 topo map for Rainier OR (large PDF or online). Looking at the 2017 Rainier OR-WA topo map (large PDF) the below sea level contour is no longer there. Using the National Map Advanced Viewer and checking spot elevations, they are all are above sea level. ACCESS: At the PA-DE line the Delaware River is tidal, but in order to be at the lowest point in PA, I feel you need to get as close to the Delaware line as possible. Fortunately there is a small park in Marcus Hook, PA which is not far from the DE line. From Claymont, DE go N on route 13 into PA. After crossing into the PA take the first possible street right (E) in Marcus Hook, just past an oil refinery. Go as far E as possible, then turn left (N). The park, on the river, will be on your right. ACCESS: This is a low point like New Mexico on what originally was a river but now is a lake due to a downstream dam. Both the dam and the Minnesota River below the dam are in Minnesota, so the SD lowpoint is on the short of the lake. From Big Stone City, SD drive N from town on Lake Street to a beach near the S end of Big Stone Lake. ACCESS: We made 3 visits to this area before we finally found a way to the TN low point. The Horseshoe Lake and Lake Cormorant 7.5' quad maps are of help here. One route is from Walls, MS which is 3mi S of the TN-MS line on US-61. This is a confusing mix of farm and levee roads, so an easier way is via Lake Cormorant. From the TN-MS line go 7.3 miles S on US-61, then turn W for 1mi to Lake Cormorant. Continue over the RR track and on W for 1.4mi to the levee road along the river. Go N on the levee road 5.8 miles to a tee where a road comes in from the E. Just N of the tee, look for a road off the W side of the levee that goes down to a gate. Ordinarily the gate is locked. You will have to try to contact the caretaker at the camp on Rock Chute (see map). The best route to the low point is shown on the map leading to where the MS-Tn boundary reaches the river. This is the TN low point, and out in the middle of the river is the tri-state corner #64 AR-MS-TN. [Ed: also published in #105-14q2-p14-15]. The levee road described by Jack is now closed to the public, but by using maps and GPS you can drive to the intersection he describes as 5.8 miles along the levee road (you drive in the dirt road from the east). The Mississippi Levee Board has locked all the gates so there's no private vehicle access to the levee road or beyond. The map shows this point to be about 2.5 miles from the river and 3/4 miles south of the border. We figured we'd have to come back for this one, but we walked up the levee to take a look. Luckily for us, we didn't need to seek permission to go on the land through the locked gate to the west of the levee because the entire Cow Island area was flooded. We hiked north along the levee for 3/4 mile to the TN/MS border and bushwhacked west about 100 yards down to the water. Due to flooding this was the shoreline of the Mississippi River and the lowpoint of Tennessee at that time. In Texas, there's a cut-off bend in the Rio Grande River just before it enters the Gulf of Mexico. The 1955 USGS map [Ed: and 1970 USGS map (large PDF)] shows this bend (named Stell-Lind Banco No 128) as slightly below sea level, but the newer 2010 map [Ed: and 2016 map (large PDF)] shows the bend hydrologically connected to the river. In addition, satellite photos in Google Earth confirm that this bend is connected to the river, so the TX lowpoint is any point on the Gulf coast. Walk up the wash a little W of N for about 2mi to the UT-AZ fence line. Find lowest point in the wash along the fence line. This is also a route to the #4 AZ-NV-UT tri-state corner which is about 3 miles due W of the UT low point. Reporter Lynn Arave wrote an article Utah's basement - Beaver Dam Wash is state's lowest elevation in the Deseret News. She describes the area (with photos) and provides directions. In an email from David Olson, he mentions that most sources say Lake Champlain is the lowest point. But Vermont has a short length of the Richelieu River that drains Lake Champlain. So logically the Richelieu River at the Canadian border is lower than Lake Champlain, although it is probably lower by less than 1 inch. [Ed: Using the National Map Advanced Viewer "spot elevation" tool, Lake Champlain is 93.77 feet while the Richelieu River is 93.24 feet. In WA, the 1953 Everett Wash. USGS map shows an area just east of town with an elevation of -2 feet, but the 2011 map shows it above sea level. WA and AK could possibly have lowpoints below sea level, but the official USGS website lists the lowpoints as sea level. Jack points out in his booklet that the USGS has not verified the elevation of the noted points. In an email from David Olson, he mentions there is a tidal-gate area north of Maxwelton which is below sea level - 47.94492, -122.43739. You can see this in the 1997 topo map for Maxwelton (large PDF or online). Looking at the 2017 topo map (large PDF) the below sea level contour is no longer there. Using the National Map Advanced Viewer and checking spot elevations, they are all at or above sea level. In an email from David Olson, he mentions there are creek beds near La Conner which are below sea level - 48.37608, -122.48211. You can see this in the 1998 topo map for La Conner (large PDF or online). Looking at the 2017 topo map (large PDF) the below sea level contour is no longer there. Using the National Map Advanced Viewer and checking spot elevations, they are all above sea level. ACCESS: Drive on US-340 from either west or east to the VA-WV line. The boundary was resurveyed in 2002 with markers placed near both edges of US-340. Park and climb down the bank from the highway to the river. There is no marker near the river so you will have to estimate where the state line comes down from the marker at the edge of the highway. Low point coordinates are: 39° 19' 16.8" N, 77° 43' 10.1" W.
[Ed: In #107-14q4-p40, Connard Hogan mentions "West Virginia's lowpoint on the rapids of the Potomac at Harper's Ferry provided an excuse to visit the Civil War Museum there.]. ACCESS: Just N of Belle Fourche, SD follow a mine road which runs parallel to US-212 but closer to the river. Follow this road to the WY line. Then hike S along the SD-WY line fence. This is ranch land in both states so cattle will probably be present. It's a good idea to get permission to be on the property. We ran into the ranch owner on the SD side, and he allowed us to proceed. Follow the fence until it ends short of the river. Take a bearing along the same line as the fence and continue to the river. This will bring you as close as possible to the WY low point. There is no marker on the river bank. This low point may also be accessed from the S side of the river but we did not investigate that route. This point is on land owned by the Budmayr family. We drove as close as possible from the north, as Jack describes, and found a closed gate saying No Tresspassing. I believe this is the intersection labeled 3205T near the bottom of the Middle Creek Butte topo map at the WY-SD border. We then drove around the east and south sides of the area, still finding no access. We finally encountered a local rancher who called Mrs. Budmayr. She graciously gave us permission, so we drove through the north gate and continued about one mile south to the river. We parked near the bridge and hiked about 200 yards west along the north side of the river to the WY-SD border. We did find a benchmark a short distance north of the river, but the N-S fenceline that starts a ways to the north, or a GPS receiver, makes it easy to locate the border. To access the lowpoint you should stop in Belle Fourche to find their phone number and call them before leaving town. ACCESS: The lowest point is on the VA side of the river at the DC-MD-VA tri-point near Jones Point. From exit 1 off I-95, just W of the Woodrow Wilson Bridge, go N into Alexandria, VA on US-1 a short distance. Turn R on Franklin Street and go several blocks to another R on S. Lee Street. Follow around under the Woodrow Wilson Bridge and park in the Jones Park parking area. From there a short walk will bring you to the river. A little N of the end of the point you will find a survey marker inscribe "DC-VA BOUNDARY 1947". Walk down to the water's edge from there. The DC-VA boundary follows the pierhead line from the extension of 2nd Street in Alexandria, VA south to the tripoint. The true low point is a few yards off shore from the survey marker, in line with the bridge pier to the north, but the water level is the same. Note: During 2003 and possibly 2004, new bridge construction may require a different route to get to Jones Park. The park has been upgraded and now has walkways throughout the area, so access is quite easy now. Please contact us at guides@highpointers.org if you have any suggestions or trip reports/updates you would like to share. This graph shows shows the highpoint (red) and lowpoint (green) elevation along with the mean (black) elevation of each state/populated-territory. Click on the image to view in full scale. This guide defined “lowest” as lowest surface elevation. Another obvious definition would include underground points such as caves, mines, etc. Scuba divers might try lowest/deepest point you can dive. The permutations start to boggle the mind. You might consider the “deepest hole” (sinkhole, basin, crater) in each of the 50 states. Andy Martin has a first draft of this list (collected with help from many contributors like Mike Schwartz and Tom Dunigan) on his website. Andy has written a nice description of “The Hole Story” (.txt file) as well as an article in the Apex to Zenith newsletter (Issue #77 – Second Quarter 2007, pages 9-10). He has data tables which are graphically displayed in the map below ( – holes, – key saddles) or Tom Dunigan’s map. Mike Schwartz is the current leader with 7 deepest holes. Back in 2003 you may remember that some scientists determined that Kansas is flatter than a pancake. But is Kansas the flattest state? Looking at the span (highpoint elevation – lowpoint elevation) we see that Florida is the flattest state at 345 feet (with Alaska the least flat at 20320 feet). Alternatively, we could look at the slope between the highpoint and lowpoint. In this case Illinois is the flattest with a slope of 0.027 degrees (with Hawaii the least flat at a whopping 8.54 degrees – although American Samoa blows the competition away at 30.16 degrees). In 2014, University of Kansas researchers did a far more rigorous analysis and confirmed that Florida is the flattest state, while Kansas was only the seventh flattest state. You may also want to read the newsletter article “The Flattest US States? Not What You Think” (Issue #105 Second Quarter 2014) and the associated National Geographic article. Somebody said what are you going to do now that you’ve done all the highpoints. I was joking, and said, I guess I will try all the low points. But earlier, in 1988 when we were going out to ski at Red Lodge we stopped at the Wyoming low point which is where the Belle Fourche River flows into South Dakota. We had to hike down along the boundary line fence. We ran into a rancher. He didn’t mind us going down there but he said, “Watch out for the bulls.” So that was the real start of it. Are there any rules for “lowpointing”? I don’t think anybody has ever done them before so I made up the rules on my own. The high tide mark is the point we count for states with sea level elevations. For interior lakes it is the high water level. Most of the interior lowpoints are where rivers exit into adjoining states and you often have to follow a fence down to the river. On larger rivers the fences don’t go all the way and you have to follow a compass heading. I don’t know how precise that is. We usually try to get down to the water itself. We stick a toe in the water. There’s no definition on how high the water has to be. We went to the lowpoint of Arizona which is the Colorado River where it runs into Mexico. When we were there there wasn’t a drop of water in it. All the water was in an irrigation ditch which runs parallel to the river. We just walked out in the middle of the dry riverbed. It was quite wide, probably 200 yards. In fact that’s where the picture on the cover of the low points book was taken. We had checked with the immigration officials. They couldn’t figure out why anyone would want to do that. I probably wouldn’t want to try it now with the current border problems. Nevada used to be difficult to access. It is at the very southern tip on the Colorado River. But recently I got an email saying that the Indians have built a casino there and it’s just a few hundred yards from the casino to the low point, and there is now a bridge across the river. It’s also a tristate-point if you go out in the middle of the river.